Thanks for your interest in Podcast Chapters. If your question isn't answered in this FAQ, feel free to reach out to me on Twitter and I'll be sure to help you out. What podcast clients can I view MP3 chapter markers in? MP3 chapter markers are supported by most podcast clients, including Apple Podcasts on iOS (provided you're on iOS 12), Overcast, Pocket Casts, Castro, and more. You can get an idea of the podcast clients that support MP3 chapter markers using this spreadsheet (you'll want column W). Please note it's not entirely up-to-date, with MP3 chapter markers quickly gaining adoption across the spectrum of podcast clients. What ID3 version does Podcast Chapters use? Podcast Chapters uses ID3 v2.3 throughout, even if the file that's imported uses a different ID3 tag (or doesn't have one at all). Can I add other podcast metadata in Podcast Chapters? Does Podcast Chapters support individual chapter artwork? As of Podcast Chapters 1.2, you can now add individual chapter artwork. In compatible podcast clients, this will show up as the show art during the time period of the chapter. Can I import markers from [some format]? 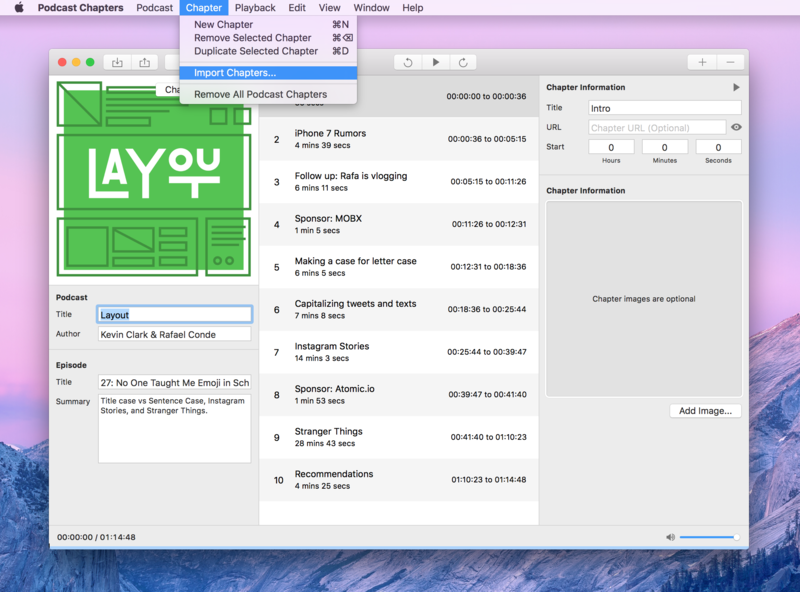 Podcast Chapters 1.2 supports importing chapter markers from cue files. You can import markers using the menu, by selecting 'Import Chapters...' from the 'Chapter' menu, and selecting a cue file. The cue files only support importing the title and the timestamp of a chapter, and if you want to add a URL or an image to the chapter, you will need to do that manually in Podcast Chapters. What happened to Thomas Pritchard? Podcast Chapters was created and developed by Thomas Pritchard from 2016 to March 2019, when he handed charge of the app over to Fredrik Björeman. I (hello!) have lent a hand with the last few releases, and I look forward to keep things going in very much the same style as before. You can read a bit more over here, if you like. I have another question that's not answered here. First of all, that's not a question, it's a statement. The best place to ask a question is on Twitter (@bjoreman), my DMs are open.